snowdeal.org > ex machina: the eric update - day 444: reading is fundamental. the eric update - day 444: reading is fundamental. 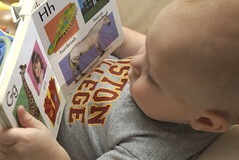 certainly there's no doubt that reading is fundamental and as important as is might be to read to full term infants to stimulate brain development, even if it's not scientifically proven, it seems like it might be even more important to read to odin given the micropreemie odds of "invisible" disabilities. and while we've been reading to odin since our earliest days in the nicu he's spent many of the past few months seemingly more interested in chewing on books rather than reading them. but every so often, he'll intentionally pick up a book - even occassionally turning it "right side up" - and casually flip through the pages scanning from left to right, all the while looking quite enthralled with the content and not the least bit interested in having mamma or pops lend a helping hand. I've found an easy solution to the chewing-rather-than-reading problem. We just read with two books at once - one for Shoshanna to chew on, and the other for me to read to her. Lolling about on the floor helps, too. She's much more content to be read to if she can climb all over you at the same time.